FS ZIP Extractor is a freeware .zip self-extractor stub that allows you to create self-extracting .zip archives that are run as an executable .exe file. See License Statements for the EULA agreement for FS ZIP Extractor. FS ZIP Extractor is used to turn a .zip file into an executable .exe so the zip can then be unzipped without having any unZIP software installed on that computer. For example, say you have a .zip archive of some files you need to share with a friend. But you are not sure if your friend has any 'unzip software' installed on their computer? By turning the .zip into a self-extracting .zip, your friend can unzip the file(s) by simply clicking on the .exe. Your friend would not need any an unzip software installed on their computer. When launched, the self-extractor will prompt for a path to extract to, whether or not to overwrite existing files, and whether or not to preserve the directory structure in the .zip (if present). You can select some or all files to extract. 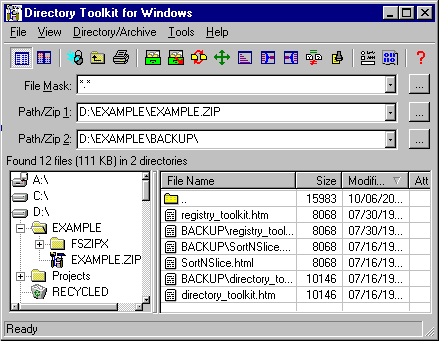 If you need a full function utility for unzipping archives, see our Directory Toolkit. 3. If you want to use the self-extractor with Directory Toolkit, copy the 'fszipx.exe' file to the same path that Directory Toolkit is installed in. Our Directory Toolkit installer uses C:\Tools\DirTkt as a default path. 1. If you are a Directory Toolkit user you may prefer to download a self-installing version --> setupfsx.exe (680 K) or setupfsx.exe (Alternate site). This self-installer defaults to installing the required files to C:\Tools\FSZipX (you can change this) and will also copy FSZipX.exe to the path where Directory Toolkit is installed if Directory Toolkit was installed using one of our standard installers. To uninstall using this method, use the entry in Control Panel/Add-Remove Programs. 2. You can download a standard zip --> fsx.zip (180K) <-- if you want to manually install. 1. If you have not already done so, place a copy of 'FsZipX.exe' into the same path that Directory Toolkit is installed in. The default path used by the Directory Toolkit installer is C:\Tools\DirTkt. 2. If the zip does not already exist, create a zip file that you want to turn into a self-extracting zip. 3. Use Directory Toolkit to open the zip you want to turn into a self-extracting zip and highlight the 'folder' icon at the top of file listing. 4. Press CTRL+M or select 'Make Self-Extract' from the Directory/Archive Menu. 5. Confirm the file name choice and click on OK.
1. Use Windows Explorer or your file manager to copy FSZipX.exe and the .zip file in question in the same folder. This can be any folder you want. 2. Open Windows Explorer on the folder you used above. Highlight FSZipX.exe file and the .zip. In the example here we will be working with Example.zip. 3. Right click and activate the Explorer Extensions Concatenate function. 4. An Explorer Extensions window similar to the below will launch that lists FSZipX.exe and the zip. If FSZipX.exe is not first in the 'Files to contcatenate' list, highlight FSZipX.exe and click on the 'Make First' button (blue arrows). FSZipX.exe MUST be first in the list! 5. Specify a name for the target file (yellow arrow above). Explorer Extensions remembers the last target file so you may need to modify the entry. You MUST specify .exe for a name extension for the target file! Above we used Example.exe. for a file name. You can use any name you want as long as it ends with .exe. You can manually type the entry or use the path browser button to navigate to a folder and specify the file name. 6. Click on the OK button to perform the concatenation. You can also concatenate fszipx.exe and the .zip manually via the built-in DOS copy command. For example, to create a self-extracting version of a zip named Example.zip, issue a command similar to the below from a MS-DOS box or the Start Menu run command. COPY /B "C:\Tools\FsZipX\FsZipX.exe" /B + "C:\Documents\Example.zip" /B "C:\Documents\Example.exe"
The above sample command line must be one single line. It may be line wrapped as you view this because of your editor display. Surround all paths with spaces in them with " characters. Contained in the FSZipX distribution is a .bat file named 'MakeFSZipX.bat'. Open an MS-DOS box and run MakeFSZipX.bat. We created MakeFSZipX.bat as an aid (with some additional checks) to the above manual concatenate method. MakeFSZipX.bat expects to be located in the same path as FSZipX.exe. Type MakeFSZipX without any file names to get some usage guidelines. That's it. Write support@funduc.com if you have questions.